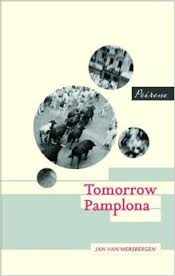 Tomorrow Pamplona by the Dutch author Jan van Mersbergen was the middle title in Peirene Press’ second year, 2011; having now read all three books (the others were Matthias Politycki’s Next World Novella and Maybe This Time by Alois Hotschnig) I would probably go as far as to say it is my favourite collection (I wouldn’t like to comment on whether its theme, Male Dilemma: Quests for Intimacy, has any bearing on that!). As with most of Peirene’s authors, it was van Mersbergen’s first appearance in English; unfortunately, it remains his only one so far (he has written at least four other novels). Much of the novel, therefore, consists of Danny and Robert travelling, a series of one-sided conversations which keep the tension slowly simmering. Their journey is interrupted by Danny’s memories (a device that feels natural as Danny would obviously be replaying these scenes in his mind as they drive), particularly his relationship with Ragna. Many of these scenes also consist of only two characters – in the gym, in a room – heightening the novel’s claustrophobic feel. You are currently browsing the archives for the Jan van Mersbergen category.